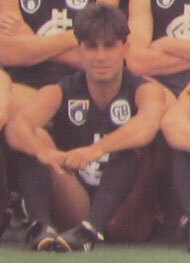 Dominic Fotia was drafted by Carlton as selection 12 in the 1986 National Draft from SA club West Torrens. His arrival at Princes Park was eagerly anticipated at the time, because he was considered one of the most promising young rovers in the country. He had made his senior debut in the SANFL aged just 16, and played 48 senior games for the SA Eagles by his nineteenth birthday (he would play 51 games and kick 34 goals from 1986 to 1988). He was also selected in the South Australian State of Origin squad before joining the Blues, so it was no surprise when guernsey number 2 was waiting for him at Princes Park in the summer of 1988-89. Fotia made a low-key start to his first year, but finished off on a high note with a taste of finals football when he played on a half-forward flank for Carlton’s Reserves on Grand Final day at the MCG. The powerful Blues outfit defeated a plucky Melbourne side by 18 points in a high-standard curtain-raiser in front of more than 90,000 fans. After another handful of senior games early in 1990, Fotia burst into the limelight at last in round 13, when Carlton took on Geelong at Princes Park. The Blues trailed by 41 points at half-time, before a spirited revival – sparked by Fotia, and spearheaded by captain Stephen Kernahan at full-forward – steamrolled the Cats to a 19-point defeat. Fotia was everywhere that afternoon, and although Kernahan booted six goals, his fellow South Australian picked up three Brownlow Medal votes in a Best on Ground display. Sadly, Dominic couldn’t maintain that form. Those were to be the only Brownlow votes of his career, and he was back in the Reserves by year’s end. The pattern of promotion and demotion continued into 1991 for Fotia, with only nine more senior matches and two goals on the board by the time Carlton wound up another fruitless season in 11th place on the 15-team ladder. Club folklore has it that pending Greg Williams’ much-heralded arrival at Princes Park in late 1991, he requested the number 2 guernsey. Fotia is said to have indicated (probably with tongue in cheek) that he would be prepared to give it up, but only in exchange for a considerable sum of money. When club President John Elliott was informed of this, he is reputed to have called Dominic into his office and told him to leave his guernsey on the table, on his way out the door. While it has become routine to look upon Fotia’s story as one of unfulfilled expectation and opportunity wasted, his involvement in football didn’t end with his departure from Carlton. In 1992 he headed to VFA club Coburg for a season, then in 1993 played for rival VFA club Werribee with Blues team-mate Tim Rieniets. After returning to SA, he continued playing and coaching at suburban and country level for many years, and in 2007 – approaching the age of 38 – he led Centrals to a Premiership in the strong Yorke Peninsula League. Contributors to this page: Bombasheldon , PatsFitztrick , molsey , WillowBlue , true_blue24 , pblue , Jarusa and admin . Page last modified on Saturday 13 of April, 2019 19:13:21 AEST by Bombasheldon. 1982 GF Ken Hunter courage.